(continued…) I just finished reading a book by Eric Metaxas called Miracles. In part one the author defines miracles, and discusses why even in this age of science we should not rule them out. He also looks at the miraculous world all around us, and, at the miracles of the Bible, especially the miracle of the resurrection of Jesus. 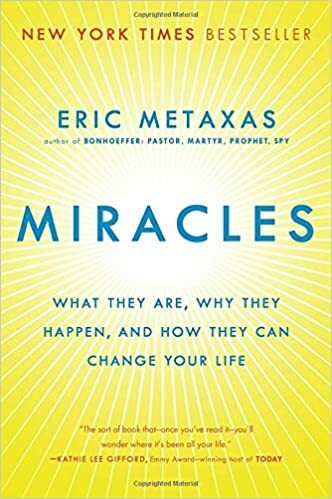 In part two, Metaxas tells stories of miracles that he has heard about; limiting himself to stories told to him by people he knows personally, and trusts. Many of the miracles have to do with answered prayers, and he has many stories of such answers—again, all by people he knows. There is even one story very similar to the one my friend tells about lost keys miraculously appearing out of nowhere. Eric Metaxas is no naïve, illiterate, gullible, backwoods, snake-handler. He is a New York Times best-selling author, a columnist and radio host, and, has a ministry called ‘Socrates in the City’ that attracts many of the high-powered politicians, intellectuals, and business leaders on Manhattan. Metaxas asks all the tough questions about prayer that you would expect from such an intelligent person. There are no easy or complete answers to a question like that, but the Bible does give some insights. Two are in Psalm 62:8, which says: “Trust in Him at all times, pour out your heart before Him; God is a refuge for us.” ‘Pour out your heart before Him,’ it says—whatever is on your heart, large or small, world peace or lost keys. We are God’s children, says the Bible, and just like children, we can bring before God whatever is on our heart, ‘at all times,’ says the verse. All times and all places and all kinds of requests. “God is our refuge,’ says the verse, and therefore, it says, TRUST IN HIM. Trust in God to respond to your request, in whatever way he sees fit, in large things and in small. God did answer my prayer for healing that one time, but not the other times. But then God did take away those headaches completely, or at least I think it was God. On a deeper level, it was God who gave me my head in the first place, and everything in it. That in itself is an amazing miracle, when you think about all the many things that a head can do. Psalm 62:5-8 — Yes, my soul, find rest in God; my hope comes from him. Truly he is my rock and my salvation; he is my fortress, I will not be shaken. My salvation and my honor depend on God; he is my mighty rock, my refuge. Trust in him at all times, you people; pour out your hearts to him, for God is our refuge. James 4:3 — When you ask, you do not receive, because you ask with wrong motives, that you may spend what you get on your pleasures. but evil keep from us, even though we pray for it.